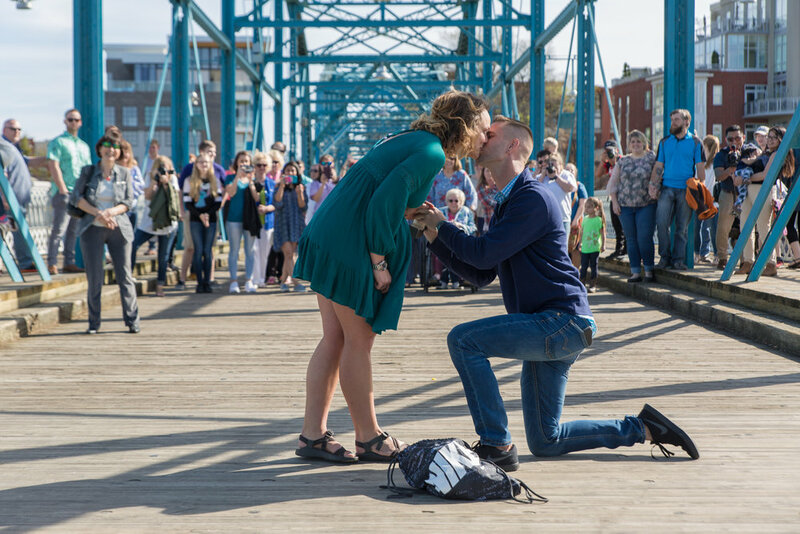 Sarah and Chase have appeared here before on the blog - you may remember the story of when Chase proposed to Sarah on the Walnut Street bridge in Chattanooga. All those people behind them were family members who snuck up as Chase led Sarah to the middle of the bridge. But now with winter winds blowing, it is a good time to look back on their wedding, which took place on a hot, steamy day in August at Hiwassee River Weddings and Events Center.in Delano, Tennessee. They did well to choose that location. I have known the owner, Bill Collins, for a couple of years and his woodland settings are idyllic. A ceremony just steps away from the lazy Hiwassee River floating by? That is the stuff of dreams but they become a reality at Hiwassee Weddings. The reception area was built to impress - nicely appointed prep rooms for both bride and groom, a kitchen for caterers, and an outstanding sound system. And something else - on this day back in August, with temperatures in the upper 90s and humidity to match, all stayed cool inside at the reception since Bill made sure the HVAC system and insulation was above par. In short, Hiwassee River offers both beauty and functionality, and that makes it one of my happy places to shoot a wedding. And what a wedding it was, with its laid back, front porch rocking chair feel. Sarah and Chase are a chill couple with a strong faith, and so their day shone in the certainty that God loves them and the rest of us. I can dig that. Sarah and Chase chose not to have a First Look, but did want to share a prayer together before their ceremony. May Sarah and Chase see each milestone of their life together surrounded by love’s warmth.